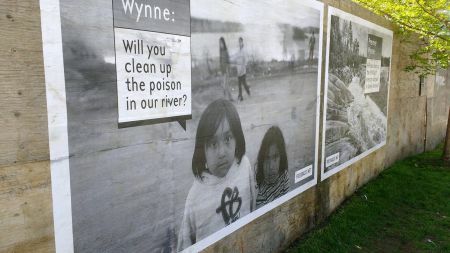 It is time once again for the Grassy Narrows River Run in downtown Toronto, this year being held on Thursday, June 2nd. The story of Grassy Narrows, or Asubpeeschoseewagong, is well known. The First Nation of around 1500 residents near the Ontario-Manitoba border has been studied from as far away as Japan, and heard at the United Nations. The reason? For years in the 1960's, a pulp mill dumped loads of mercury into the English-Wabigoon River system. The community is still feeling the effects, and the mercury has never been cleaned up. In the meantime, the Ontario government issued permits for clear-cut logging on Grassy Narrows' territory. Under Treaty 3, which governs the land, such outright destruction of habitats relied upon for hunting, gathering and fishing are not permissible, though Canadian governments and courts have disregarded this. In 2002, Grassy Narrows residents took it upon themselves to block a key logging road. Owing to the perseverance of community members and help from allies, the blockade continues to this day. A number of people from Grassy Narrows have made the journey to Toronto this week. And they have a busy schedule. On Monday morning there is a press conference at Queen's Park for a study to be be presented, compiled by a team of scientists and professors. Preliminary reports are that their assessment will claim it is feasible to clean up the mercury-contaminated lakes and rivers. This remediation option has long been ruled out by Ontario governments. The following morning Grassy Narrows community leaders will respond to the study, along with staff from the David Suzuki Foundation and Amnesty International. Then on Tuesday night at Ryerson there will be a talk open to the public. Speaking will be Grassy Narrows Chief Chief Simon Fobister Sr., Clan Mother Judy Da Silva, environmentalist Avi Lewis, and youth singers. Youth in the community, in collaboration with the travelling music production crew N'We Jinan, put together a song that went viral back in March, Home to Me, expressing their love for the land and their community. Tuesday's talk will at 245 Church Street, Vari Engineering Building, room ENG 103. Wednesday might seem like a breather but it's really a day to get set for Thursday's River Run, a major production. Starting at noon at Queen's Park on Thursday, June 2nd, the River Run is the week's main event. The highly artistic, family-friendly rally takes to the streets with oodles of blue fabric to create a wild river through Toronto's streets, symbolizing the community's wish to see their river flow with life again. The River Run was also held in 2010, 2012, and 2014.